After a 29 year run as CEO and president of the New York Botanical Garden (NYBG) in Bronx, NY, Gregory Long retired on June 30, 2018. Mr. Long started his career at NYBG in 1989 to advance the Garden’s advocacy for the plant kingdom by creating beautiful living plant collections that receive worldwide recognition. Mr. Long’s accomplishments over the years have resulted in an immense impact financially on NYBG’s growth, including the development of 43 major capital projects, including 15 new gardens and landscape renovations. Under Mr. Long’s leadership, membership rates have increased steadily over the years. For 15 years OvS Principal Sheila Brady has had the pleasure of working with Mr. Long on two featured gardens; The Native Plant Garden designed to showcase plants native to northeastern North America and The Azalea Garden, for which she designed a series of companion plantings for one of the most important collections of azaleas in the United States. Stepping into the Chief Executive role is Dr. Carrie Rebora Barratt, who will be the first woman to head the Garden. Dr. Barratt has an extensive background as an executive leader and museum management and a Ph.D. in the History of Art from the Graduate Center of the City University of New York. She is also an Archives of American Art Board Member, serves on the Stewardship Council of the Omega Institute for Holistic Studies, and volunteers in the garden at the Park Slope Women’s Shelter. 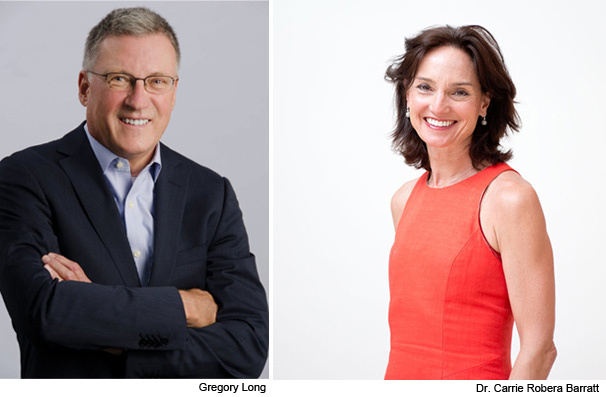 OvS salutes Gregory Long on his prolific career and on his next adventure, and we offer a warm welcome to Dr. Barratt as she embarks on her journey with NYBG.